The 'External Access Links Manager' addin enables Autodesk® Revit® users to view the links in Revit project files without having to open them. Once a Revit project file is selected, the 'External Access Links Manager' interface populates with data about the links in that project. Actions can then be performed on those links including re-pathing and setting the links to be loaded or unloaded the next time the project is opened. The user can also generate TXT or Microsoft Excel reports which will list out information about every link associated with that Revit project file. A summary of the 'External Access Links Manager' addins functionality is shown below. For a more detailed explanation please refer to the help documentation. 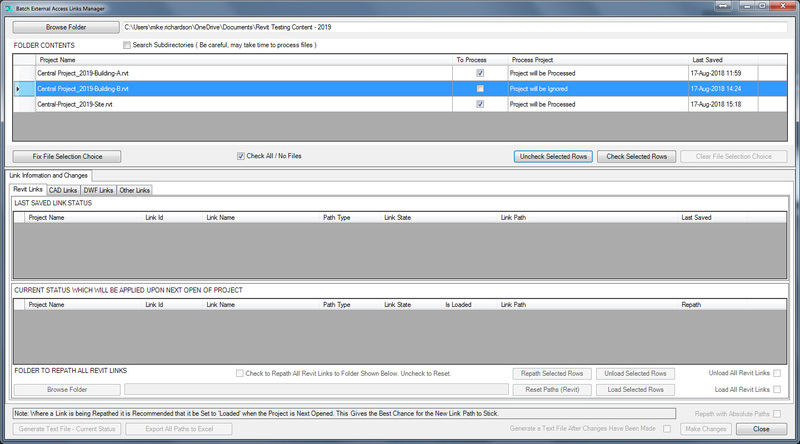 The interface (Shown in the screenshots below) allows the Revit user to view the 'Last Saved' state of the links in a Revit project and the 'status which will be applied to the links when the Revit project is next opened'. 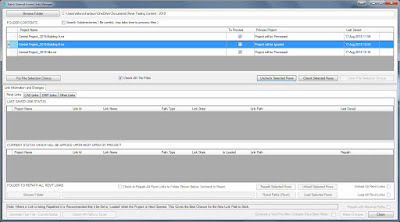 The interface allows the Revit user to re-path multiple links at the same time, each of the links individually, or all links of that type (Types include Revit, DWF and CAD) to one folder, making it quick to re-path links if a folder containing links has been moved for instance. 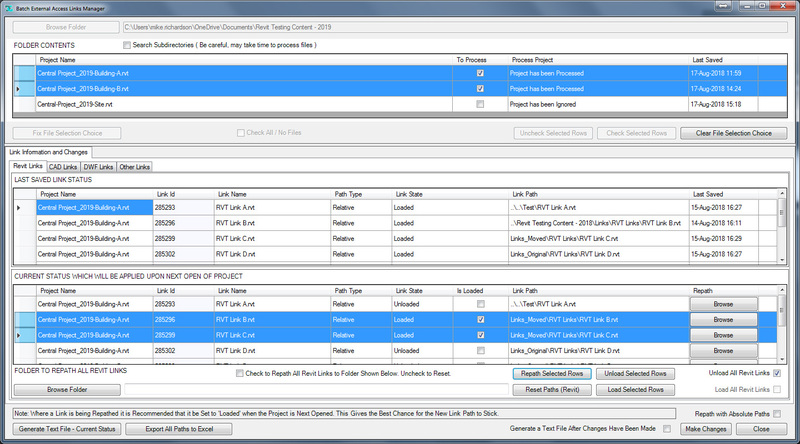 The interface allows the Revit user to set links to be loaded or unloaded when the Revit project is next opened. Simply use the checkboxes in the 'Is Loaded' column, use the 'Load All' / 'Load None' checkboxes, or select multiple rows and use the 'Unload / Load Selected Rows' buttons (Refer to the screenshots below). The Revit user can generate TXT or Microsoft Excel reports which list out information about every link associated with that Revit project file. The following information about each link will be printed to a TXT 'tab delimited' file, or a new Excel Workbook. The Microsoft Excel output also includes a 'Link Type' field, and filtering is automatically applied to the columns to enable quick interrogation. 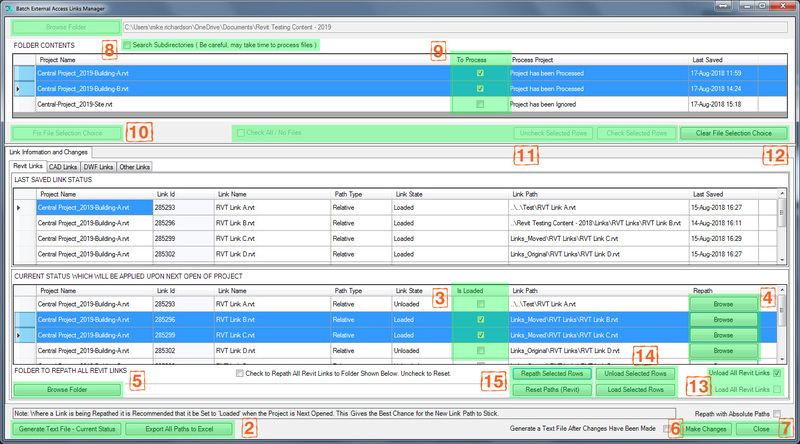 The TXT and Microsoft Excel reports can be generated without any changes being made to the Revit project file. They can also be generated after changes have been made. In each case the 'Last Saved' state of the links in a Revit project and the 'status which will be applied to the links when the Revit project is next opened' will be printed to the file. 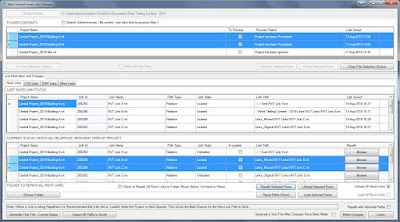 External Access Links Manager is brought to you by Mike Richardson Design. It's free.